Terrorism is not a new creation; however, it is also undeniable that the current terrorist threat presents new and special challenges to our society. Indeed, the recent wave of terrorist activity has been particularly damaging and profound. The effects of the terrorism of the past few years have transformed and will long continue to influence the way we live for decades, if not centuries, to come. While many of these changes have occurred as a direct result of the acts of terrorists themselves, others have followed and will continue to grow out of our collective response to the acts of the terrorists. 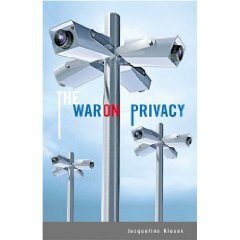 The War on Privacy is densely packed with information about privacy issues around the globe. Author Jacqueline Klosek, a Certified Information Privacy Professional and attorney with Goodwin Procter LLP in New York City, has divided the book into sections which focus on each region of the world. She analyzes how the United States, Africa, the Middle East, Europe, Northern and Southern Neighbors (of the U.S.), South America, Australia, New Zealand, and Asia handle privacy rights, particularly after 9/11. I’ll admit it wasn’t the easiest read for someone who wanted to go to law school but got dismal LSAT scores. Klosek’s intensive research and thorough appraisal of privacy in every region is so complete that The War on Privacy is the ideal reference for privacy issues. Jacqueline Klosek has answered an arsenal of questions from me. Her writing and interest in this topic’s importance shines through in the book. I have listed what I learned from reading The War on Privacy. —European Data Protection Directive—prohibits export of any personal data from European Union [EU] to third countries without sufficient protection to personal data. –Arabic has no equivalent to the English word privacy. Privacy in the Middle East relates to women and family. —Tunisia (where one of my closest friends from high school has lived with her Tunisian husband and two children for nearly 20 years) became the first Arab country to enact a comprehensive data privacy law. This is part of the Pump up the Volume Book tour. This entry was posted on December 14, 2009, 01:43 and is filed under Books. You can follow any responses to this entry through RSS 2.0. Both comments and pings are currently closed.